This is the perfect time of year to enjoy fresh produce and farm fresh eggs for a beautiful, colorful meal. Although most people only think of eggs for breakfast, this meal is great for any quick meal, any time of the day. One of the best things about this recipe, besides the taste, is the big bang-for-your-buck in terms of health benefits. Don't let the simplicity of the dish fool you. There is more flavor in the small dish than in some of the most elaborate recipes you can find. 1. In a small skillet, over medium-low heat, melt 1/2 Tablespoon butter. Add the onion and tomatoes. Cook for 2 minutes, until tender. 2. In a bowl, whisk together the egg and egg whites. Pour over the onions and tomatoes. Using a spatula, carefully begin stirring the eggs. Add the spinach. 3. Cook the eggs and vegetables over medium-low heat for 3-4 minutes, stirring frequently to provide a light and fluffy scramble. If the egg is setting too quickly, reduce the heat. 4. When the scramble is almost completely set, sprinkle with cheese, salt and pepper (to taste). Continue to gently stir. 5. Lay the sliced avocado on a plate and then top with the warm scramble. This recipe was inspired by Ree Drummond, The Pioneer Woman. I have tried several different pizza dough recipes over the years and have never been really happy with any of them; I was struggling to find a soft, pillowy dough for my homemade pizza recipes. However, that all changed while watching my favorite cooking show when she made calzones with dinner roll dough. I was shocked! Really?? Frozen bread dough for pizzas??? I had to try it and quick! What I discovered was phenomenal. I finally had the soft, billowy dough I had been working so hard to make from scratch, and it was easier and cheaper than anything I had tried before. These pizza pockets are delicious, a crowd pleaser, and budget friendly. My husband loves these so much that we have had them once a week for the past two weeks and he has gladly taken the leftovers for lunch, which is a win in my book! This recipe is basically a technique. You can customize the fillings with your favorites, but I would make sure not to put a lot of liquid in the pocket or it will come out soggy. Even if you want an all vegetable filling, you would still need to sauté them prior to filling to soften and remove some of the excess liquid. These are slightly spicy, but all you have to do is reduce the red pepper flakes or remove them all together, replacing with regular black pepper for a child's pallet. You can serve these with a side of warm marinara or garlic butter. 1. In preparation for making the pockets, thaw one loaf of bread dough that has been coated with oil. Place on a sheet pan and cover with a kitchen towel. Allow to sit in a warm spot for 4 hours to thaw. 2. In a large skillet, heat oil over Medium heat. Crumble the sausage into the pan. Using the back of a spatula, break the sausage into small pieces while it cooks. Cook for 5 minutes, stirring frequently. 3. When the sausage is almost completely cooked, add the onion, pepper, Italian seasoning, and garlic. Stir to combine. Cook for 3 minutes, stirring occasionally. 4. Add the mushrooms and spinach to the pan. Stir to completely combine. Reduce heat to Medium Low. Cook for 5 minutes, stirring occasionally. The mushrooms should be cooked and the liquid from the spinach mostly evaporated. While the filling cools, begin to prepare your dough. 6. Cut the thawed dough into 3 equal segments. Place 1 segment onto a lightly floured surface. Using a rolling pin, roll the dough into an oblong oval and very thin. 7. To assemble your pocket, you will be working on one half of the dough leaving a 1-inch border from the edge. Place 1/4 cup Mozzarella cheese on the dough. Top with a third of the cooled sausage mixture, followed by 6 pepperoni slices. Top with another 1/4 cup of cheese and then sprinkle with a tablespoon of parmesan. Gently fold the top of the pocket over the filling to join the other end. Use a floured fork to press the edges together. Place the pocket on a baking pan that has been sprayed with non-stick cooking oil. 8. Repeat step 7 for the remaining pockets. 9. Use the fork to poke holes into the top of the pocket. These will allow for venting during the baking process. 10. Combine the butter, garlic, and parsley. Using a pastry brush, spread over the top of the pizza pockets, making sure to also spread over the edges. 11. Place in a 350-degree preheated oven. Bake for 20-25 minutes, until golden brown. 12. Remove from the oven and allow to cool for 2-3 minutes before serving. 13. Slice in half and serve. Note: The bread I use is simply the Rhodes White Bread dough. They come 5 to a pack in the freezer department. For smaller pockets, you can use the White Dinner Rolls dough instead. I could not wait to share this recipe! I will be honest, I am not the biggest fan of pasta salads, but this recipe has changed my outlook! I am used to pastas coated in a thick mayonnaise or loaded with Italian dressing, neither of which says "Yummy!" to me. This recipe combines a fresh vinaigrette with perfectly ripened vegetables. One of the great things is that this salad has it all. You get you starch, vitamins, and protein! Additionally, since there is no mayonnaise involved, you can take this to a picnic and not have to worry. 1. Place a large pot on the stove. Fill with 8 cups of cold water. Bring to a rolling boil. Season the water with salt. Add the pasta. Cook for 7-9 minutes, until al dente. Drain. While the pasta cooks, prepare the remaining items. 2. Chop the cucumber, tomato, and avocado into bite size pieces. Place all of the vegetables into a large bowl. 3. In a blend, combine all of the vinaigrette items except the oil. Blend on high until completely smooth. Carefully remove the center of the blender lid and stream in the olive oil. Continue to blend for 1 minute. 4. Pour the hot pasta onto the vegetables. Top with vinaigrette and stir, completely coating all of the pasta and vegetables with the dressing. Add additional salt, to taste. 5. Serve warm, at room temperature, or chilled. Store leftovers in an airtight container in the refrigerator. Note: If you do not serve it immediately, make sure to stir before enjoying to redistribute the vinaigrette. Today is my husband's birthday and I woke up prepared to make him anything he wanted for his big day's breakfast. 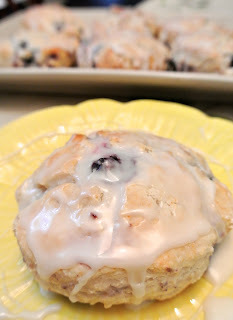 I was truly expecting some meal laden with bacon, sausage, or eggs, but, surprisingly, he requested blueberry biscuits. I will be honest, I had never made blueberry biscuits, but I have made hundreds of batches of biscuits in my life and I was not about to back down to the challenge. My inspiration for the biscuits comes from a fast food restaurant in North Carolina and some other Southern states. However, I did a twist on the standard glaze and went with a lemon glaze instead. The glaze was the key! You get a flaky, tender biscuit with plump berries finished off by a refreshing citrus tart. A-MA-ZING! You could easily adapt this for a brunch or shower by using a smaller biscuit cutter and make them bite-size. All you would have to do is reduce the time of baking and wallah, blueberry tea biscuits! 1. Sift the flour, sugar, baking powder, and salt together into a large mixing bowl. 2. Add the butter to the bowl. Using your hands, or a pastry cutter, carefully work the butter into the dry ingredients until it resembles peas. 3. Create a well in the middle of the mixture. While slowly swirling your hand in the dry ingredients, slowly stream in the milk. The batter should be very wet and sticky. 4. Gently fold the blueberries into the dough. Note: I used frozen blueberries, but you may use fresh if you have them on hand. 5. Prepare a rolling mat with flour. You will want to be generous here so the dough does not stick. Place the dough in the middle of the flour and carefully coat with flour, pressing slightly. Knead the dough lightly, 3-4 times. Shape into a flattened round, approximately 1/2" thick. 6. Using a well-floured biscuit cutter, cut the biscuits and place them on a liberally greased baking sheet. Fold any scrap pieces and shape back out. Get as many biscuits from the dough as possible. Note: In the South, it is traditional to even use the final scraps to make a small biscuit. We do not let any of the glorious dough go to waste! 7. Bake in the preheated oven for 25 minutes. 8. Remove from the oven and allow to sit while you make the glaze. 9. For the glaze, combine the powdered sugar, vanilla, and lemon juice in a small bowl. Stir until you have a creamy, thick glaze. 10. 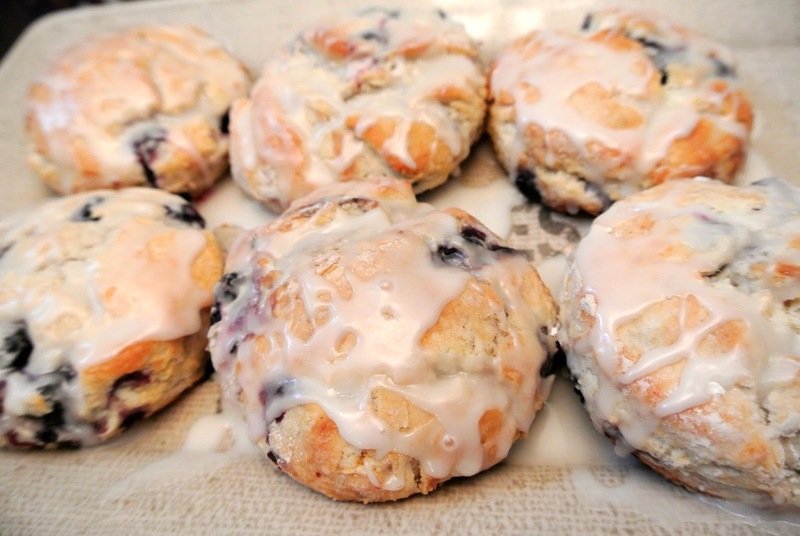 Use a fork to drizzle the glaze over the slightly cooled biscuits. Thoroughly coat each biscuit. I think when people hear the word "brisket," they are immediately intimidated. All you hear on television is about it turning out tough or dry unless cooked by a talented pit master. While I can attest that cooking one on the grill is tricky, picture a charred chunk of meat, but the slow cooker is a perfect pairing for the novice brisket cook. This recipe produced a tender brisket covered in a concentrated sauce, perfect for sandwiches or sliced on a platter. 1. Slice the onion into 1/2" rings. Separate the rings and layer onto the bottom of the slow cooker. Top with sliced garlic. Lay the brisket onto the bed of aromatics. 2. In a large measuring cup, combine all of the sauce ingredients. Whisk to thoroughly combine. Pour the sauce over the brisket and aromatics, making sure to leave a thick layer of sauce on top of the meat. 4. Remove from the slow cooker and slice against the grain. Place the meat back in the sauce. Nothing seems to scream Summertime more than fresh berries straight from the fields. It is always great to get large bounties of fruit when they ripen, but, you might find yourself looking for something different to do in an effort to enjoy all the deliciousness. This past week, I was going to a covered dish dinner and decided to make one of my famous pound cakes with fresh strawberries. While I knew that the result would be good, I had no idea exactly how delicious it would be once complete. Imagine strawberry shortcake inside of a pound cake; that is how I would describe this cake. One gentleman at the dinner actually said, "This is the kind of cake that would make a bulldog break his chain!" I will take that as a compliment. 5. Beginning with one-third of the dry ingredients, alternate dry ingredients and milk, allowing each step to become incorporated before alternating. You will do two alternating cycles, ending with the flour. Carefully stir in the chopped strawberries. 7. The cooking time will depend on the size of your pan and your oven. After 1 hour 15 minutes, check the cake. When it is brown on top, firm, and a toothpick comes out clean, your cake is done. Summer squash is a Southern favorite. I love it almost any way it comes......casserole, steamed, sautéed ...however, my husband is not as flexible. He likes the traditional fried squash, and that is about it! But being the modern southern girl I am, I prefer to find a lighter way to enjoy the same flavors; for this recipe, that meant doing away with the frying and modifying the recipe to baking. My mom was actually the first perfect this technique. She started baking her squash when I was in college; she is just like my husband in that she only wants her squash battered and fried, so she wanted a simpler, healthier way to enjoy this summertime delight. We also use this exact same cooking technique and batter for our zucchini as well. You should try this recipe for your next summer dinner. You will love the crisp texture without all the grease, and the cleanup is much easier than standing by a stove cooking in grease. 2. Slice the squash into 1/4" thick rings. 3. Prepare a breading station. Prepare one bowl with beaten egg and another bowl with cornmeal, salt, and pepper. Have a large baking sheet at the end that has been prepared with vegetable oil. 4. Bread the squash by placing each ring in the egg and then coating on both sides with seasoned cornmeal. Gently shake to release excess breading and then place on the baking sheet. Continue the process for all the squash and arrange in an even, single layer on the baking pan. Do not stack! 5. Place in the preheated oven on the middle rack. Bake for 35-45 minutes and then flip. Allow to cook for an additional 25-30 minutes on the second side. Note: Cooking time will vary based on your oven. Cook until golden brown on each side. So my husband is away this week and I decided to experiment with ingredients I love that he is, well, let's just say, not too fond of eating. Tonight's selections include avocado and spinach. This recipe was a winner! The rolled up filet steak gets filled with cheese and spinach and then topped with a lovely avocado cream sauce. While it tastes completely decadent, it is actually a light indulgence. 1. Combine all of ingredients for the cream sauce in a food processor. Run until completely smooth. Add additional salt and pepper to taste. Cover and refrigerate until ready to use. 2. Place the filet between two sheets of wax paper. Using either a mallet or rolling pin, flatten the steak until 1/4-inch thick. 3. Sprinkle the steak with salt and pepper. Arrange the provolone cheese on the steak, making sure to not hang over the edge. Top with spinach. 4. Carefully roll the steak, tucking the cheese and spinach on the inside. Use a toothpick to secure. Sprinkle with additional cracked pepper. 5. Heat olive oil over medium heat in a skillet. When hot, place the steak, seasoned side down, in the hot oil. Cook for 5 minutes. Turn and cook for an additional 5 minutes. Rotate to the final side and cook for 5 more minutes. 6. Remove the cooked steak from the pan and allow to rest for 5 minutes. 7. Serve with sautéed vegetables and avocado cream sauce. Note: Store extra Avocado Cream Sauce in the refrigerator, covered, and use for sandwiches, chicken, or as a dip for veggies. Cookies, cookies, cookies......is there anything better than a really good cookie at the end of a party? For our Fourth of July celebration, I did not want to make some large cake or elaborate dessert. I considered cupcakes, but that didn't seem different enough. I decided to go old school and create a whoopie pie, a tender chocolate sandwich cookie with a creamy filling. This recipe is different from other recipes I have made because the filling is creamy and smooth, rather than the typical frosting center. This recipe was a big hit, allowed everyone to keep socializing while enjoying a handheld dessert, and the extras are great for a decadent snack. 1. Combine te cocoa and water in a small bowl. Stir until thoroughly combined. Set aside to cool. 2. In the bowl of a mixer fitted with a paddle attachment, cream the shortening and sugar. Add the cooled chocolate liquid, eggs, and vanilla. Mix to combine. 3. In a separate bowl, combine the flour, baking soda, baking powder, and salt. Combine the milk and vinegar in a small measuring cup. 4. Add 1/3 of the dry mixture to the chocolate mixture. Stir to combine. Stream in 1/2 of the milk mixture. Repeat finishing with the dry mixture. Mix until creamy and smooth. 5. Prepare baking sheets by thoroughly greasing with shortening. Spoon tablespoon size scoops of the chocolate batter onto the pan allowing 2 inches of room between each cookie. 6. Bake at 350 degrees for 12 minutes. 7. Remove from the oven and allow to cool completely. 8. While the cookies are cooling, prepare the filling. 9. In the bowl of a mixer fitter with a whisk attachment, cream the butter and cream cheese until fluffy. Add the vanilla, milk and salt. Whisk until combined. Slowly add in the sugar, 1/2 cup at a time. Add enough sugar to make the filling thick enough to hold together but not stiff; you should be able to form soft peaks. 10. Spread the filling onto the bottom of one cooled cookie. Top with another cookie to create a sandwich. 11. Place the sandwich cookies into the refrigerator for at least 20 minutes before serving, allowing the filling to set. 12. Store extra cookies in an airtight container in the refrigerator. Summertime is a time to enjoy the freshness of the garden and the bounty of the season. A co-worker of my husband gave him some beautiful Thai basil from her garden this week and I could not wait to make something delicious. This recipe uses thin chicken breasts, which means they cook very quickly. The light breading and pan frying provide a thin yet crispy crust, reminiscent of southern fried chicken without all of the heaviness and fat. The marinade allows the chicken breast to be infused with the beautiful basil aroma and a slight spice. This chicken recipe is perfect for summer! 1. Arrange the chicken breasts in a large dish. 2. Combine the marinade ingredients in a small bowl. Spoon over the chicken. Using your hands, spread the marinade evenly over the breasts. Cover with plastic wrap. Allow to sit in the refrigerator for at least 3 hours. 3. When ready to bake the chicken, begin by arranging your breading station. You will need three dishes. First bowl will have flour. Second bowl with have beaten eggs. Third bowl will be the bread crumbs. By arranging your station, it makes the breading process much easier and a lot less messy. 4. Dredge each piece of chicken. Do no wipe the marinade off the chicken. Dredge the chicken into the flour, then egg, then coat with bread crumbs. Place on a baking sheet that has been covered with a wire rack. This will allow the breading to set before cooking. You want to allow it to sit for 2-3 minutes prior to frying. 5. While the breading is setting, heat the butter and oil in a large skillet over medium heat. When the oil is hot and slightly bubbling with the butter, place the fillets carefully in the pan. You may need to cook in batches as you do not want to crowd the pan. Cook for 3-4 minutes per side (cooking time will depend on the thickness of your chicken) until golden brown and crisp. Flip and cook for an additional 3-4 minutes on the second side. Place on a clean wire rack to drain excess oil. 6. Repeat the process for the remaining chicken breasts.